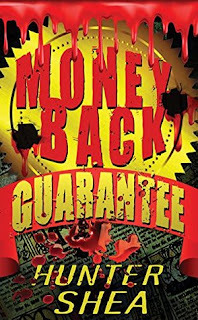 Money Back Guarantee is a whole lot of fun and nicely rounds off author Hunter Shea's trio of novellas in his 'Mail Order Massacre' series; which I highly recommend. This is exactly how tongue-in-cheek, 80s-style horror should be done! When Rosemary orders a toy 'nuclear submarine' from an advert in the back of a comic book for son Dwight, it starts a downward spiral of strange events. Dwight almost drowns when he tests the cardboard sub in pal Jimmy's swimming pool. 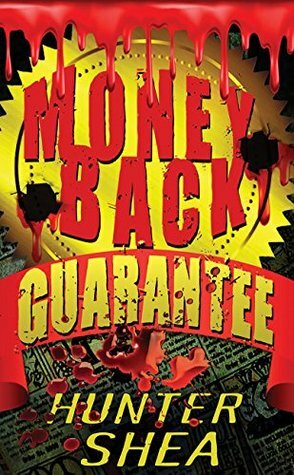 Enraged, Rosemary tries to complain and secure a refund but things start to go horribly wrong. That's all I'm going to say for fear of spoiling the great entertainment. This novella can easily be read in one sitting and forges ahead at a stonking pace. The intended reading sequence is - Just Add Water, Optical Delusion and finally Money Back Guarantee (the first two also having been reviewed on my blog). One word of warning though - just don't take them too seriously! YOUR MONEY BACK OR YOUR LIFE . . . Protect America’s shores with your very own nuclear submarine! Constructed from durable fiberboard material, this submersible is large enough for two kids! Sail off into imaginative international intrigue for just $1.99! If this toy doesn’t float your boat, return it for a full refund! With her son’s heart set on piloting his own nuclear submarine, Rosemary Lanchester orders the craft advertised on the back of a comic book. What arrives is more sub-standard than submarine, but her son loves the cheap piece of cardboard. Until he and a friend nearly drown when they take the sub for a deep sea dive in the swimming pool. Enraged, Rosemary reports the toy’s manufacturer to the Better Business Bureau. The company’s customer service center retaliates with threatening phone calls. Then her son and husband mysteriously disappear. To save her family, Rosemary tracks down the company’s headquarters with the help of her brother—a survivalist with enough toys of his own to wage an all-out war. And she still wants her $1.99 refunded.